The first step is to find your teammates. These can be friends, people you have seen at your local paintball joint or even people you find through social media/community notice boards. We recommend keeping an eye out for potential team members next time you play paintball at Spec Ops Paintball. Before you officially welcome anyone into your crew, make sure that you first play a trial game. This will give you the chance to assess whether or not your team members work well together. Remember to add people with a variety of different skills – you need a balance of different playing styles to even out your team and to give you the best chance of game success. Another step is to define your goals. Are you playing to have fun? Are you serious competitors? Do you want to enter tournaments? Do you want to try and find sponsorship? (Yep, paintball sponsorship is a thing!). Making sure your whole team is on the same page by having a clear mission statement will help to prevent frustration and dropouts in the future. Once you have agreed on your goals, you need to create a game schedule. Find out when everyone is available and figure out which dates and times suit your team. It can be handy to have substitute players on call in case some of your regular teammates can’t make it to a game. Before you assign team roles, we recommend that you first play a few games and assess what each team member is good at. Fast runners make good frontmen. Accurate shooters make good snipers. Players who are heavy-shooters make good backmen and defensive players. Well-rounded players make for a good infantry. You might also want to think about potential strategies you could use, considering the skills of your players. You also need to assign a team leader – this person will be the main point of contact in and out of paintball games, and they need to be a good leader and negotiator. This role doesn’t have to be set in stone – you can change leaders every few months or so if everyone wants a go at taking control of the team. Regular practice makes for a great team – you will learn to communicate, strategise and achieve team goals, all the while vastly improving your paintball skills. It’s simple – the more you practice, the better your team will be. 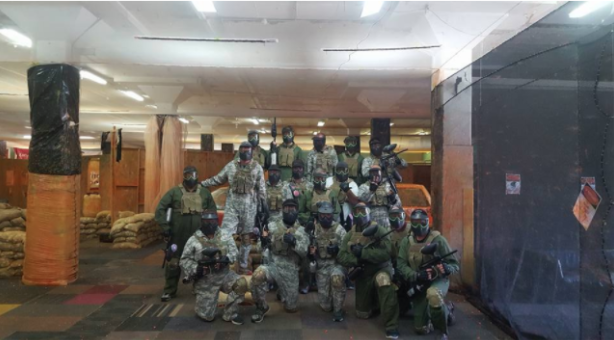 We recommend that you play paintball at least twice a month, and that you also organise events outside of paintball, like dinners and movies etc. The more you get to know each other, the more you will trust each other, and trust is essential for a strong paintball team. A solid paintball team will endure victory, defeat, ups and downs without falling apart. The hallmark of a successful paintball team isn’t simply how much they win – it’s how well they handle defeat, and how solid they can remain despite adversity. A weak team will fall apart when things start to get tough – a strong team will be motivated to try harder. The CT Games is a tactical competition where teams of six battle it out in the most realistic tactical game paintball can offer. Designed by an ex special forces soldier, the CT Games will take place on the 17th of September and are the ultimate test of skill, tactics and teamwork. Want to be as prepared as possible for the CT Games? We will be running intensive training sessions on the 6th and 7th of September.